Industrial – INFINITY ENTERPRISES, INC.
Septic tank drainage related problems can be improved. By using the characteristic of oil water separation, you can expect long cleaning power. For high-purity aluminum and other non-ferrous metals. Great for removing mineral oils. Meets MILSPEC and BOEING requirements. Welding and soldering burns, scaling (oxide coating) rust, dissolution and cleaning of inorganic materials, etc. Not subject to Poisonous Substance Control law. Organic solvent poisoning prevention rule, PRTR, fire regulations. Easily and safely remove cured and hardened paints, even if several coats are present. Safe washing system, using plant-based cleaning fluid. Reduce costs by keeping processes in-house. Cleaning system using safe, plant-based cleaning fluids. Powerful cleaning AND high safety. Washing and drying in one unit. 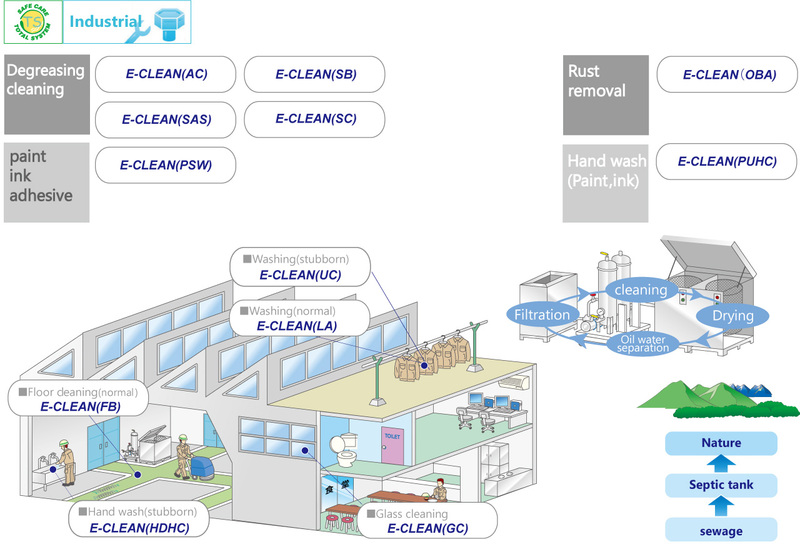 Various E-CLEAN products can be used. Washing liquid can be heated up to 80℃. Conventional water-based cleaning solutions become more effective. Well suited for peeling cleaning with E-CLEAN(PSW). Easy to use 18 liters size. Can use E-CLEAN(PSW) to wash paint, etc. All floor surfaces in various factories. Can be used in machine or manually via brushing, direct wiping, etc. for floor cleaning.